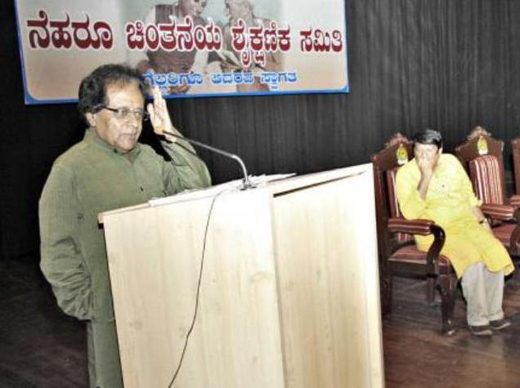 Mangaluru, May 16, 2015: Delivering a special lecture on ’Significance of Nehru’s political thoughts in the present context,’ organised by Mangalore University’s ’Nehru Chinthaneya Shaikshanika Samithi’ at Mangalagangothri, Former education minister B K Chandrashekhar, lamented that caste system continued to be a critical issue even today. Subtle efforts are on to turn back the wheels of history. It is often mistaken that Jawaharlal Nehru’s secular ideologies were anti-religious. But, Nehru himself has stated that he is not against religious beliefs, but against organised religion which suppresses people and against actions where people are exploited in the name of religion. The anti-secular, ideological offences should stop, B K Chandrashekhar said. "The ideals of Nehru on caste system are not known sufficiently known. Nehru maintained that there will be no secularism without parliamentary democracy. Nehru was for enlightened secularism which guarantees equal opportunities for all," he said. He further said Nehru had an accurate unbiased perspective of history. His works ’Discovery of India’ and ’Glimpses of World History,’ are evident of this. He meanwhile called upon Mangalore University to publish the two major works of Nehru in Kannada, may be in a concise form. Former minister, Chandrashekhar felt for a need to build a society which is free of dangerous superstitious beliefs. He further said that though the idea of anti-superstition law was good, law alone is insufficient to change the mindset of people. Superstitious beliefs are alive in highly urban areas in Bengaluru as well, he said. He quoted Prime Minister Narendra Modi’s answer at an interview by Time Magazine, saying, of all Indian religious doctrines, the Indian Constitution is of high relevance to him. Chandrashekhar added that the statement by the PM suggests how important the Constitution is, for a country like India. Expressing his displeasure over the working of universities in Karnataka with respect to social activism, the former education minister called upon the academic communities, including universities to come to the fore and to speak on social issues and ideas which can change the society. MU Vice Chancellor Prof K Byrappa, Registrar Prof P S Yedapadithaya and Nehru Chinthaneya Shaikshanika Samithi Convener Rajaram Tholpady were present. Prizes were awarded to the winners of competitions organised by the Samithi.